Geometrical series is taken highly important when preparing for competitive exams like SBI, PNB, clerk etc. So, what is a Geometrical Series exactly? This is series formed by the multiplying the first term by a number to get the another and the process will be continued to make a number series that will increase swiftly and given as the name Geometric Progression. The sum of geometric series would be finite as long as long the value of the ratio is less than one or a number close to zero. When a number comes closer to zero, it becomes infinitely small, allowing a sum to be calculated for the series containing infinitely small numbers. The sum is calculated for the self-similar series. If the value of r lies between -1 and +1 then terms in the series will get smaller and it will reach to the zero in the limit soon. In this case, the value of r is one-half and the sum of the series is one. If the value of r is greater than one less than -1 then series would get larger in size and magnitude. 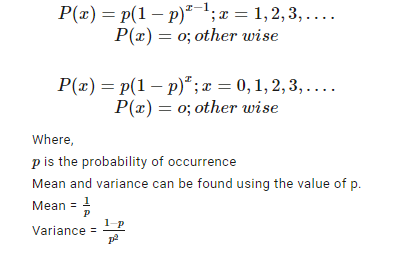 The value of r is one in the series then all terms should be equal in the series. If the value of r is -1 then the sum of terms will lie between two values always. Take an example, where you are asking to the people outside a polling booth who they voted. Few would reply the truth while others may simply confuse you with wrong answers. So, there are chances of failure before you actually succeed in your observation. where a1 is the first term and r would be the common ratio. This is possible to calculate the sum of infinite GP as well but you will not get a final answer.